Choose from over 60 classic flavors, and discover the rich taste and quality consistency in each and every DaVinci Gourmet product, including this cherry flavoring syrup! DaVinci Gourmet flavoring syrups are made from pure cane sugar to complement your beverages without overpowering them or being too sweet. They are specially formulated to hold up well under heat, making them the perfect choice for espresso-based drinks, brewed coffee or tea, and more. 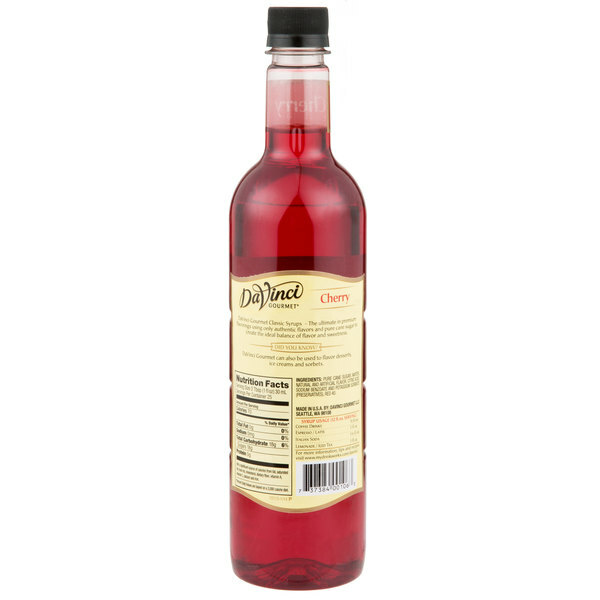 Add cherry flavoring to any Italian soda, snow cone, fruit punch, or mixed drink with this DaVinci Gourmet cherry flavoring syrup! This syrup features an eye-catching red color and sweet yet tart flavor. Try drizzling it on a cherry cheesecake for something new! One splash of flavoring syrup goes a long way, and flavored beverages enhance your menu with new, appealing items. This user-friendly plastic bottle is easy for your baristas and restaurant staff to handle. Sold in gourmet coffee shops, specialty food stores, food service outlets, and grocery stores, DaVinci Gourmet products, like this cherry syrup, have a long history of commitment to quality and superior taste. 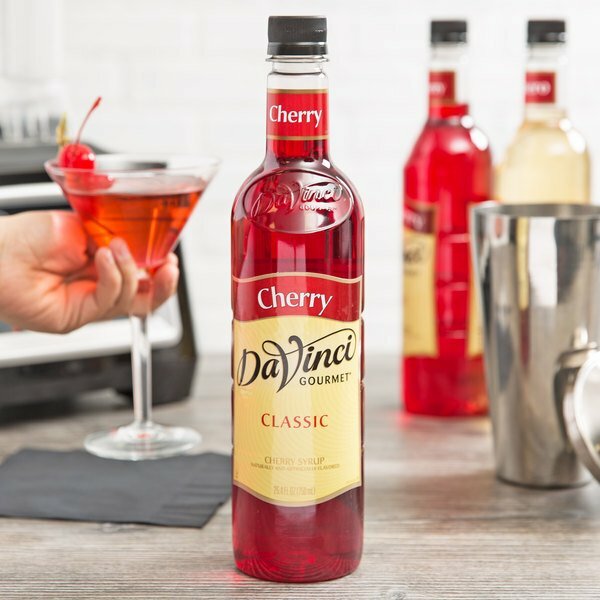 DaVinci classic Cherry flavoring has great cherry flavor for adding to teas or making cocktails. The flavoring syrup has just the right amount to sweetness. This sweet cherry syrup is great for all frozen and cold drinks. Mixes in great with teas either black or green. Gives that strong cherry flavor without being overwhelming. A very strong tasting cherry syrup that can lean toward the medicine tasting side if your not careful. It is a great product, but you must using sparingly. I love so many of the other flavors from DaVinci, but this one honestly tastes like cough syrup. It's just horrible on so many levels. I use this syrup for Italian Sodas and Cherry Vanilla Frappes. It has a very tradition taste that people love on deserts as well as beverages. 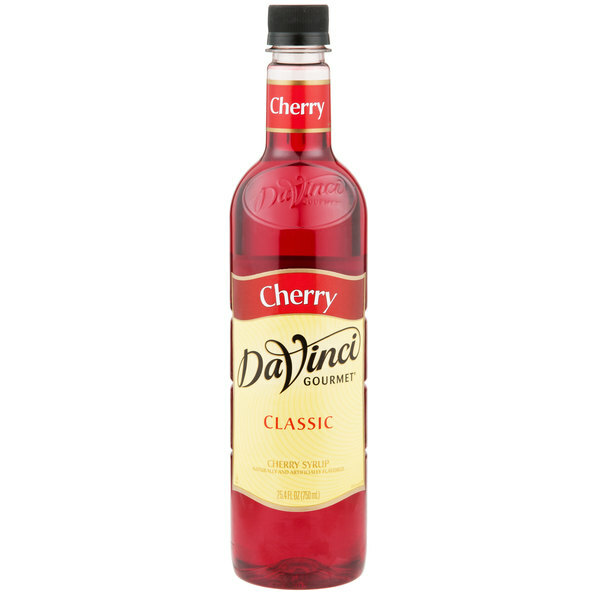 I bought DaVinci Gourmet flavoring syrup in raspberry and loved it so much I bought cherry. You will not be disappointed if you buy more then one flavor.